Grab that selfie stick and pick a filter (“Hefe” gives even the palest complexion a hint of sun-kissed SLO CAL vacation glow). We&apos;ve got 7 Instagram-worthy natural wonders to throw up on the &apos;Gram this spring. 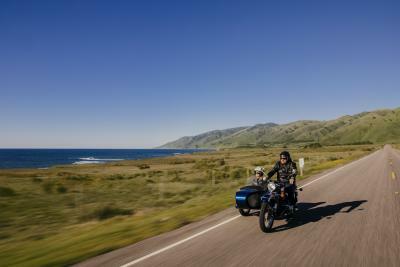 From fields of vibrant flowers to a coastal drive worthy of the fanciest car commercial—these SLO CAL scenes only appear to be photoshopped. These aren&apos;t just a few flowers in a field we&apos;re talking about here. Some of California&apos;s most incredible Super Bloom viewing spots can be seen from space! SLO CAL received a very welcome wet winter, and the hillsides are now covered in multicolored wildflowers as far as the eye can see. The Carrizo Plain National Monument Super Bloom is a great spot to view this absolutely mind-boggling display. Your social media followers will agree: This is Mother Nature&apos;s finest work of art yet. Hurry, though! This sight won&apos;t bloom forever. 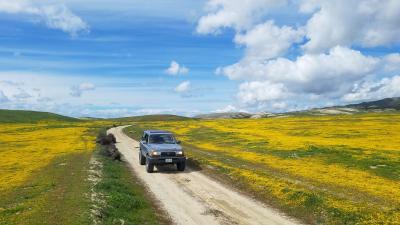 Photo op: The Carrizo Plain is home to early flowering plants such as goldfields (seen around Soda Lake Road), although the wildflower display will change as the season goes on. Be well prepared for the trip, as Carrizo Plain typically takes 1.5-2 hours from Northern or Southern SLO CAL and offers no services. Download a map, fill up with fuel, bring food and water and (this goes without saying) be mindful of the flowers when you step. Montana de Oro literally means “Mountain of Gold” in Spanish. During the spring, travelers get to see why. Located six miles southwest of Morro Bay (another great photo op), this stunning state park features 8,000 acres of cliffs, sandy beaches, coastal views, streams, canyons and hills. Check out the tide pools (an easy trek from the road to the sea) or climb Valencia Peak for an unparalleled selfie. Extra points for using the Valencia filter. Photo op: Although we ask that you don&apos;t remove any sea-critters from their protective tide pool environment, you can take as many pics as you want! They aren&apos;t camera shy—unless you count the sea cucumber, who prefers to stay out of the limelight. The nearby El Moro Elfin Forest in Los Osos (home to ancient Pygmy Oak trees) is another fabulous place to let your photographer flag fly. 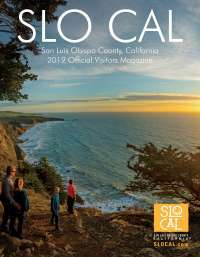 Each spring, SLO CAL is reborn in shades of green: Emerald, lime, and olive, to name a few. The Irish Hills Open Space in San Luis Obispo got its name because (you guessed it) the undulating green hills look pretty similar to Ireland. Hike the Froom Creek Trail Loop (leashed dogs welcome) or hop in the car and check out nearby Prefumo Canyon, which radiates with National Geographic allure. Take a meandering drive from Prefumo Canyon Road up and over the green, grassy mountain. At the top, you&apos;ll gasp at the gorgeous view of Morro Rock and Pacific Ocean below. Head west and drive through lovely See Canyon apple orchards. You&apos;ll end in Avila Beach, where friendly beaches meet tasty adventures. Sorry, but your phone will likely be out of photo space by the time you get there. Perhaps delete a few of those brunch pics and make some room. Photo opp: Stop at Kelsey See Canyon Winery for a glass of local apple-infused white wine and a selfie with roaming peacocks. Spring in Paso Robles Wine Country means miles of lush vines and wine glasses brimming with ruby enchantment. Walk the vineyard, and you&apos;ll see buds forming the beginnings of the next vintage. With blue, cloudless skies and super temperate climate, you might think you&apos;re in France (heck, the grapes themselves get fooled from time to time). Whether you prefer white, pink, or red, you&apos;ll find more than world-class wine in Paso Robles and nearby Templeton. In fact, you might even spot the perfect place for that group shot of you and your old college buddies, all together at last. Raise your glass, say, “Cabernet” and make memories as you sip and swirl. Tip: Take home two of each bottle, one for now and one for later, when you meet up with your friends in a year or five. Photo op: Tooth and Nail Winery on Highway 46 West is something straight from a fairy tale. The gothic castle aesthetic makes for an impressive selfie backdrop for even for the most casual heir to the throne. Fire up the barbecue and get grilling. With stately oak trees, well-groomed grass and calm lapping waters, Atascadero Lake Park is a peaceful and serene spring escape worthy of an All-American picnic. Grab the fam and hop in a paddle boat or stroll around the nearby Charles Paddock Zoo, where you can snap a selfie with a real-life Malayan Tiger. This photo may even make the next holiday card. Photo op: April 13-28, Charles Paddock Zoo will host its Spring Festival. Special wildlife celebrities will take the spotlight in fur and feathers. Got sand? 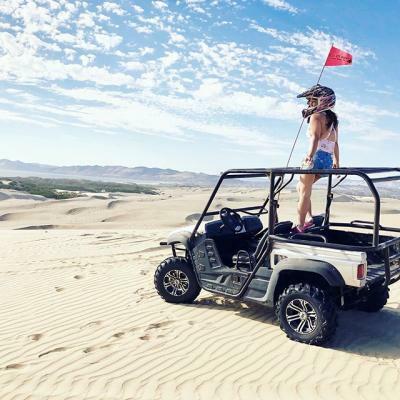 Whether you arrive in an RV or a car, the Oceano Dunes Natural Preserve welcomes your sense of adventure (and your best side—whether it&apos;s the right or left). 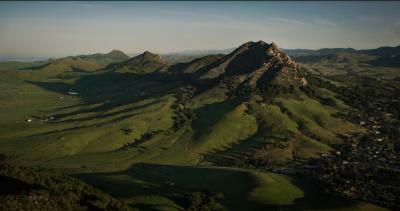 This is a surreal landscape unlike any other in SLO CAL—not unlike landing on the moon. Temperate spring is the perfect time to walk these sandy bluffs in search of sea glass or throw caution to the wind and hop onto a horse, off-road vehicle or ATV (yes, you can ride on the beach here). Either way, this unique coastal playground offers up a field day for photographers (fearless or not). Photo op: Crackling bonfires light up the night sky at the Oceano Dunes. As sunset falls and the embers catch fire, pose for a majestic campfire shot that truly deserves the honor of your laptop screensaver. Hey, you&apos;ll have to look at it till next spring break! Feel like you&apos;re in a car commercial and love every moment of it. Driving along Highway 1 from Morro Bay up to Ragged Point, you may think to yourself, “Could this view be any more photogenic?” The rugged cliffs, the crashing waves, the endless blue sky dotted with seabirds—you have stumbled upon the supermodel of SLO CAL photo opportunities. Well, the truth is, it can only get better. Make a stop at The Ragged Point Inn and lean back into a deck chair overlooking this seaside splendor. Perched high above the waves, you&apos;ll feel on top of the world. Well, you aren&apos;t wrong! Photo op: A unique circular statue overlooks the meeting of surf and rock at Ragged Point Inn. This is the perfect place to point your camera (and it is a SLO CAL photographic tradition to get a photo with your head nestled inside). Don&apos;t worry, we won&apos;t tell.